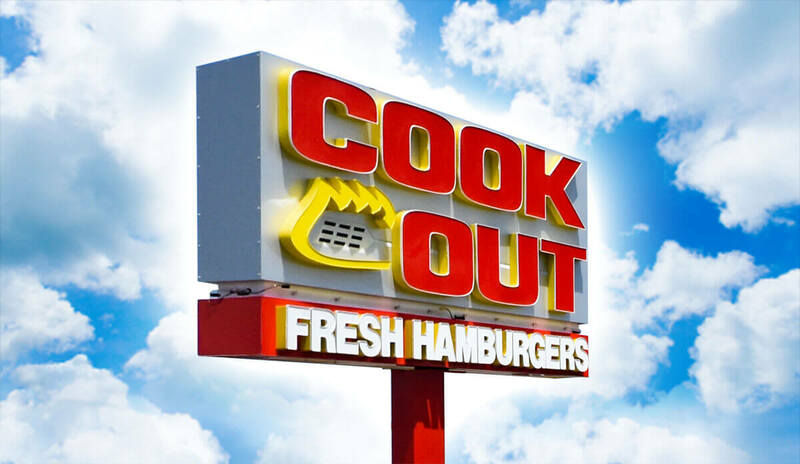 LOOK OUT FOR COOK OUT COMING TO YOUR NEIGHBORHOOD SOON! Our fresh never frozen hamburgers which we cook "outdoors style" have created a fantastic following throughout the Southeast and have won us over 200 awards. But all the awards don't mean much to us if our customers don't leave happy and look forward to their next visit. If you can't decide or if you're feeling adventurous you can always try one of our hand crafted and delicious styles. No matter what your craving, the value at Cook Out is second to none; we always make every chargrilled burger, chicken sandwich, BBQ sandwich, and hot dog to order just the way you like them. We have built our business on providing the most variety for our customer's dollar. Whether you visit one of our many restaurants for lunch, dinner, or to satisfy that late night craving our managers and their teams are dedicated to serving you a fresh, hot, high quality meal every time you pull up to our menu board. So break the daily monotony of those national chains and drive into your local Cook Out location today! Cook Out cares about the quality of both its food and service. If you were not 100% satisfied with your recent experience, please call 1-866-547-0011 to speak with one of our customer service representatives. We would love to hear about your experience and follow up with you from there. © 2017 COOK OUT. All Rights Reserved.